US Consul General Mary Etta Tarnowka in HCM City and Swedish Ambassador Pereric Hogberg during separate meetings with Secretary of the HCM City Party Committee Dinh La Thang on September 19 affirmed that they want to step up trade and investment ties with Vietnam and Ho Chi Minh City in particular. 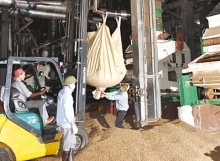 The newly-accredited US Consul General said she is aware of her responsibility to encourage US enterprises to invest in Vietnam. Tarnowka informed her host that she and US Ambassador Ted Osius will have a working session with leaders of the American Chamber of Commerce in Vietnam this week to discuss measures to boost bilateral investment. Ted Osius and other US Ambassadors in ASEAN member countries will return to the US in the next few weeks to accelerate the country’s ratification of the Trans-Pacific (TPP) agreement, of which Vietnam is a signatory. Thang said municipal leaders would create optimal conditions for US investors, noting his hope that the Consul General will help the US become the city’s largest investor. The official said he believes that Fulbright University Vietnam will soon be operational, contributing to bringing Vietnamese and US people closer. 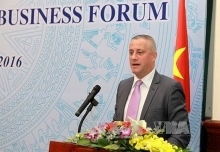 Meanwhile, Pereric Hogberg noted that Swedish enterprises are interested in investment and trade in Ho Chi Minh City. Sweden’s new trade minister has selected Vietnam as the first Southeast Asian country to visit in October since taking office, the ambassador said, adding that the minister will be accompanied by Swedish businesses who plan to study investment opportunities in Vietnam and HCM City. 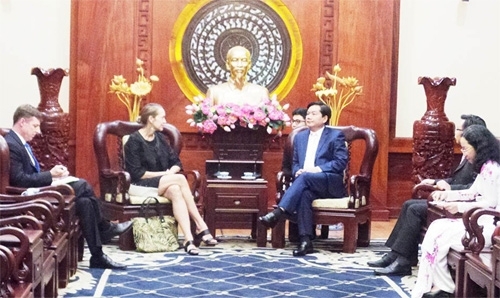 Sweden stands ready to share its experience in urban development with HCM City, he added./.